How and Where to Buy Celebrex? Celebrex and the generic Celecoxib is available online through Canadian Pharmacy World. A valid prescription is required. You can place on order online at CanadianPharmacyWorld.com, How To Order or call Customer Service at 1866-485-7979. Are there Alternative Names for the Brand and Generic Celebrex? The brand name Celebrex comes from New Zealand and is manufactured by Pfizer. The generic Celecoxib comes from UK, Canada and India also called Cobix. The generic Celecoxib from Canada is manufactured by Apotex. What Dosages and Forms is Celebrex available in? Celebrex is available in the strength of 100 mg and 200 mg tablets. Celebrex 200 mg - is a white and gold colored capsule with the pill imprint “7767 200”. 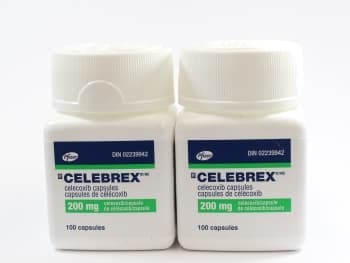 Celebrex (Celecoxib) is used to treat pain and swelling caused by many conditions such as arthritis, ankylosing spondylitis and menstrual pain. Celecoxib is a nonsteroidal anti-inflammatory drug (NSAID). This medication works by reducing hormones (prostaglandins) that cause pain and swelling in the body. Celebrex may also be used to treat juvenile rheumatoid arthritis in children who are at least two years old. Celebrex capsules should be taken with a full glass of water. It may take up to two weeks of taking this medication regularly before you get the full benefit of the medication. What are the Possible Side Effects of Celebrex? Are there any Precautions or Drug Interactions for Celebrex? You should not take Celebrex if you are allergic to Celecoxib or if you have any other allergies. Before using this medication, talk to your doctor about your doctor about your medical conditions and about all the medications you currently take. Celebrex may cause stomach bleeding. Drinking and smoking increases this risk. This medication passes into breast milk. There may be an interaction between Celebrex and other medications such as alcohol, aliskiren, amiodarone, atomoxetine, carbamazepine, chloroquine, clopidogrel, cyclosporine, desmopressin, digoxin, gemfibrozil, risperidone, tacrolimus, tacrolimus, tamoxifen, tretinoin, etc. Celebrex should be store in a tightly closed container at room temperature away from children. It should not be stored in the bathroom.